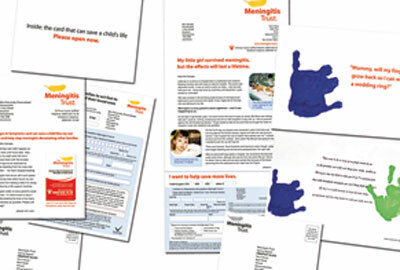 For the past two years, the Meningitis Trust has sent out a direct mail pack focusing on a case study featuring Lydia - a two-and-a-half-year-old who lost some of her fingers to meningitis. The envelope of the pack had the line: "Mummy, will my fingers grow back so I can wear a wedding ring?" Inside, the pack focused on the case study, but also asked for a donation so that the charity could send out more cards with the signs and symptoms of meningitis, which alert parents to the early stages of the disease. Recently, the agency DMS was challenged to put together a more effective pack. It decided to focus on the signs and symptoms card. It used a case study of a boy called Alex as well, but not as prominently. Both packs went to 9,000 cold donors. The Lydia pack received 87 donations, with an income of £823; it cost £5,884. Alex received 117 donations with an income of £1,403, on a cost of £13,360. Claire Wood, senior account manager at DMS, says this loss is normal for packs sent to a cold audience - the idea is to increase the number of people on the charity's donor database. She says one of the main reasons the DMS pack was more expensive was the agency fees involved. The Alex pack is simple and direct, if a little familiar. The message on the envelope is clear - "Inside: the card that can save a child's life. Please open now" - and the distressing contents are offset by bright, uncluttered presentation. The Lydia pack is more problematic. A certain amount of raw emotion can engage a reader with the mission of a health charity, but the combination of visuals and copy here is too hard-hitting. I think many recipients - especially parents - would find this upsetting.